Posted on July 30, 2018. Last modified on March 02, 2019. Read Disclaimer. A root vegetable that very much resembles turnip or radish, maca has been harvested for thousands of years in the highlands of Peru. It traditionally grows at very high elevations -- where the soil is so poor and conditions are so harsh -- that few other plants grow there. This means that traditionally, no herbicides have been needed and most maca (at that which is grown in the traditional Peruvian mountains) is therefore "organic." 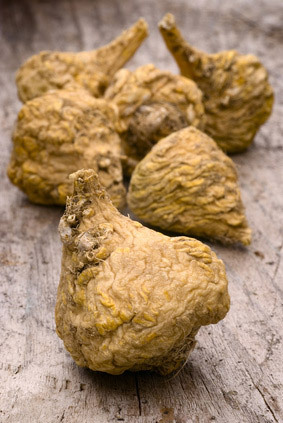 What does maca root do for you? Traditionally, maca is most often roasted, peeled and eaten as a vegetable but it is also commonly dried and used in a flour for baking, boiled to create a tea or coffee, eaten as a porridge, added in pudding, jams and blended with milk, fruit and cinnamon to create what most of us would recognize as a smoothie. And unlike many maca powders on the market here in the US, traditionally maca has never been consumed raw but rather is always cooked in some manner. In fact, Peruvian highland cultures associate uncooked maca with adverse health effects. This is why some maca supplements and superfoods are gelatinized… a process whereby the maca is cooked and dried to break down the difficult to digest starches in maca that causes digestive discomfort in some people. Until recently in Peru, maca was discounted as "a poor person's crop" which resulted in little research being conducted. However, the plant has traditionally been associated with increased energy, improved mental focus, and as an aid in managing stress. Herders who feed maca to their livestock have long believed that the offspring tend to be born larger and more robust. And this may have prompted it's reputation as a aid for balancing human hormones – supposedly helping to enhance fertility, manage menopausal symptoms and boost libido in women while acting as a natural Viagra for men. Unfortunately, research to support these claims has largely been mixed. Maca is high in protein (13-16%), carbohydrates, some essential vitamins and minerals and provides a fair amount of fiber. Some people have a difficult time digesting the raw starches in maca root -- which can result in painful digestive problems. Because of this side effect and the fact that Peruvians never consume uncooked maca, we prefer to buy only gelatinized maca powder in our home. What is gelatinized maca -- and how is it different than raw maca? In order to preserve maximum nutrients, the raw maca powder we most commonly find in the U.S. is dried at very low heat. On the other hand, gelatinized maca is cooked at high heat before grinding into powder. This gelatinization process removes the difficult-to-digest starch. As a result, gelatinized maca powder is more concentrated with the nutrients being easier to digest and absorb. Persons suffering from thyroid problems because of the high iron content in maca. Pregnant and/or mothers who are breastfeeding their infants. Have anything to add about of maca root and/or concerns? We'd love to hear your feedback!